Get bright, natural acoustic tone with enough power for small stages. 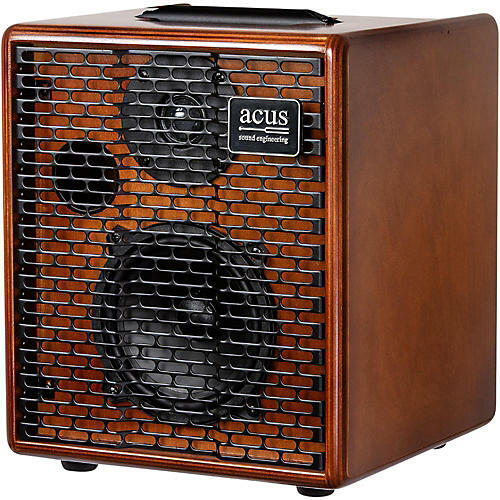 Acus Sound Engineering developed the One for Strings range to amplify the sound level of all acoustic instruments (notably acoustic and classical guitars) without altering their natural tone or resonance. One for Strings amps are designed in minimalist style, with custom speakers, cabinets and highly reliable electronic components, all together capable of amplifying harmonics with natural tone. The One for Strings 5 is ultra-compact and very versatile, for simultaneous guitar and microphone input. It includes a sensivity switch, volume, high, middle, low and reverb. The dedicated aux. input (with his own volume control) can be used for playback or to play along with your favorite songs. The system also features balanced 1/4" jack direct output, 40W woofer power, electronic crossover, compression tweeter and 2-way bass reflex.